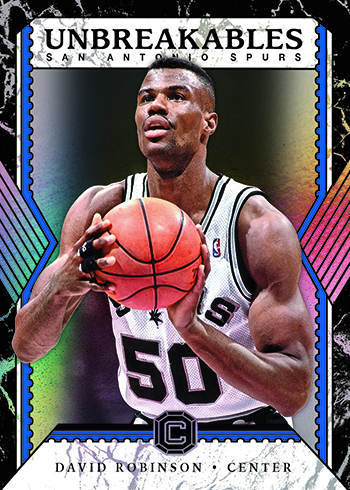 2017-18 Panini Cornerstones Basketball ($140 per box) arrives Wednesday at Sports Cards Plus. Each 6-Card Box delivers 2 Autographs, 1 Memorabilia, 1 Special Card Stock PVC Insert and 2 low numbered base cards/parallels (150 Veterans each #d/165 and less, 39 Rookies each #d/199 and less). 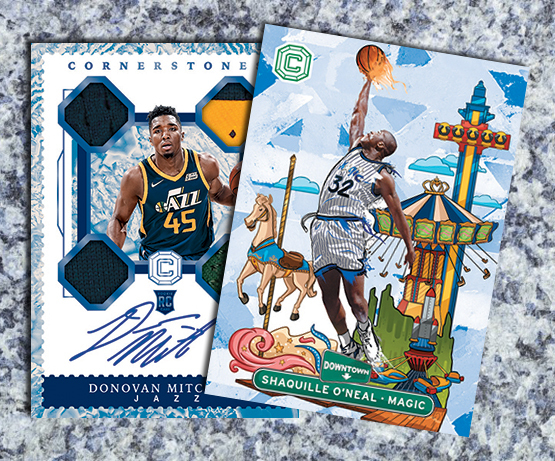 2017-18 Panini Cornerstones Basketball gets its name from the autograph quad memorabilia card in each box. This is one of the carryover elements as these types of Cornerstone cards appeared in 2016-17 Panini Grand Reserve. These come an on-card autograph and four swatches laid out in four different corners. Base versions have no more than 199 copies each. Parallels stick with the stone theme, coming in Crystal (/75), Quartz (/49), Granite (/25), Marble (/10) and Onyx (1/1). Besides the lower numbering, all parallels have at least one Prime swatch with a patch or other premium piece. Marble and Onyx cards are all prime. The full Cornerstones checklist includes veterans, retired players and rookies. 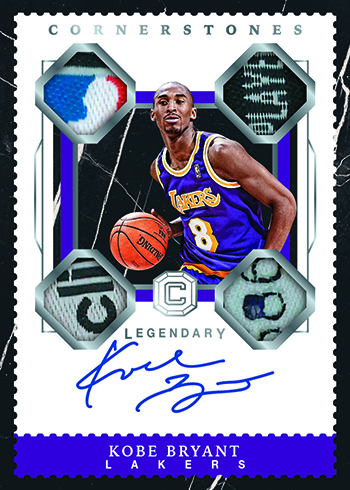 Besides the Cornerstones card, each box of the product has two additional hits. At least one of these is an autograph. Signed inserts include Keystone Signatures and Pillars of Power Autographs. 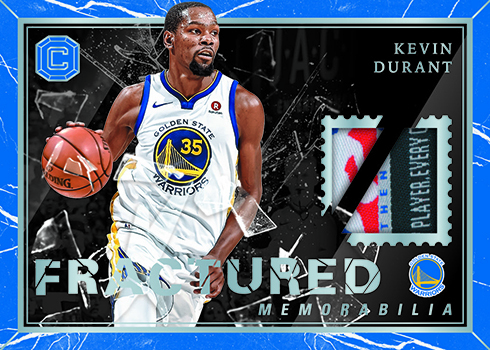 Among the relic offering is Fractured Memorabilia. 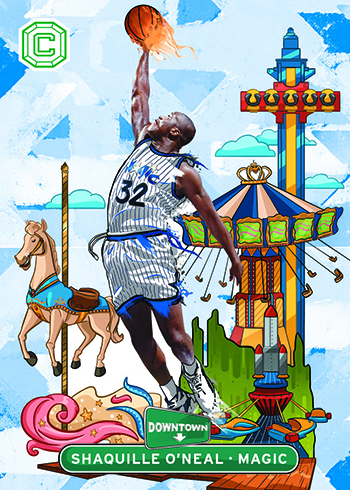 Downtown is an off-shoot of the popular From Downtown inserts found in 2016-17 Studio Basketball. The mix of player photo with a location-based cartoon returns. 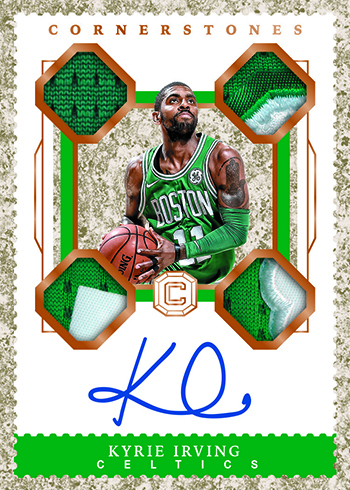 Like all regular inserts in 2017-18 Panini Cornerstones Basketball, they’re done on PVC.